Diving organised by Gary Pittaway NORFED Secretary. Dive the classic wrecks of the Sound of Mull. Diving Friday, Saturday and Sunday. Accommodation included on Thursday, Friday and Saturday. Price £88 per diver per day, two dives per day (£264 for three days) Accommodation is included in this price, based on 2 sharing a room. This is a self catering trip but if enough interest, our hosts can provide breakfast, lunch and dinner if we wish at extra cost. The charming village of Lochaline sits at the southern tip of the beautiful and tranquil Morvern peninsula which is noted as one of the most remote parts of North-West Scotland. It is well-known for the variety of bird life, flora and fauna. The area affords opportunities for fly fishing for salmon, trout and sea trout with shore fishing off the pier or local rocks. 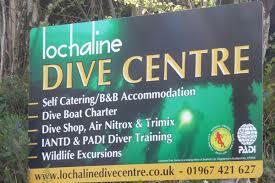 Lochaline Dive Centre offers quality services to divers coming to visit the world-renowned Sound of Mull which is home to some of the best wreck dives in the UK. Visitors may be interested in visiting the Carved Stones of Keil Church which stands high above the Sound of Mull, just one mile west of Lochaline.